Does it really pay to be prepared? It may bring about a sense of security, but being ready for any of a number disasters to strike at any time is exhausting. How does this effect our work, relationships and the rest of our real life? The cast of The Drill took training courses to learn First Aid, how to disarm an attacker and other such responses to modern emergencies. As part of these courses, attendees are required to roleplay as victims to make it seem more real. It’s all fun and games until the course participants’ personal lives are impacted by the intensity of the practiced scenarios. Amarnah Amuludun, Luke Lampard and Ellice Stevens practice the techniques they learnt with a blend of commitment and reluctance familiar to anyone who’s ever had to take one of these courses. Billy Barrett and Ellice Stevens’ script intersperses these scenes with monologues of the characters’ lives. These are funny, touching and relatable, effectively capturing the balance with which we move through life – whilst on the tube, we’re aware of the people around us but contemplating what to have for dinner. The use of video introduces other views of disaster preparation and juxtaposes with the personal stories that gradually emerge from the characters. There’s a good balance between the warmly personal and the coldly militaristic, and a brief glimpse at the difficult shift between the two when we are expected to ‘say it’ after ‘seeing it’. This moment’s inner conflict, as poignant as it is, deserves more time. 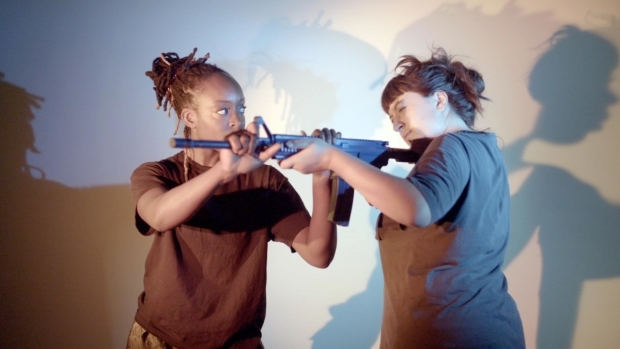 Breach’s fourth show, whilst keeping their signature blend of documentary, fiction and reenactment, here looks to the hypothetical rather than an event in the past. As rehearsal and real life merge, it asks us to reflect on our own rehearsals, be they a bomb threat or a first date. It’s a compelling work from this young company quickly establishing themselves as one of the country’s leading company of theatremakers. The Drill runs through 17 February.